ALA 2007 Survey Web designer? 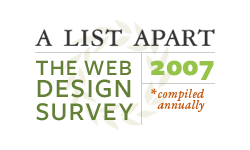 Go take the List Apart Web Design Survey! It’s an easy way to crowdsource insight into the rapidly growing field of web design. So take a moment to share some anonymous statistics, which will help the community understand more about our skills, education, employment, income, and more. So what are you still waiting for? Go take the survey!